Private libraries can be the parent or the root of the library. If the private library folder you provide contains a .h file it is considered a library, else it is consider the parent of libraries. As far as I remember there are no known bugs in this area. i have added teensy in the private hardware path and also i have added the directory of my libraries to the private software path. All the libraries contain the header files but when i try to add a library to the selected project, the list is empty and now i get a " Unhandled event loop exception" error. Also teensy board has not be added to the "platform and board" menu. I installed the Eclipse Pluin on Mac (Eclipse Photon). I added the hardware platform "Adafruit/hardware/samd/1.2.1" and want to use "Adafruit Metro M4 (SAMD51)" board. Do you know, how to install and include "sam.h"? It should work. I can't tell based on the info you provided what could be the root cause. However eclipse provides all the tools and openness to find out yourself. Are you running Sloeber V4.3? Does this also happen with a new default sketch? Is the package correctly installed? Is the package dependent on another package? Firstly, love this plugin! I've got a bit of a weird situation though... I've got a sketch to run on an Atmega2560. 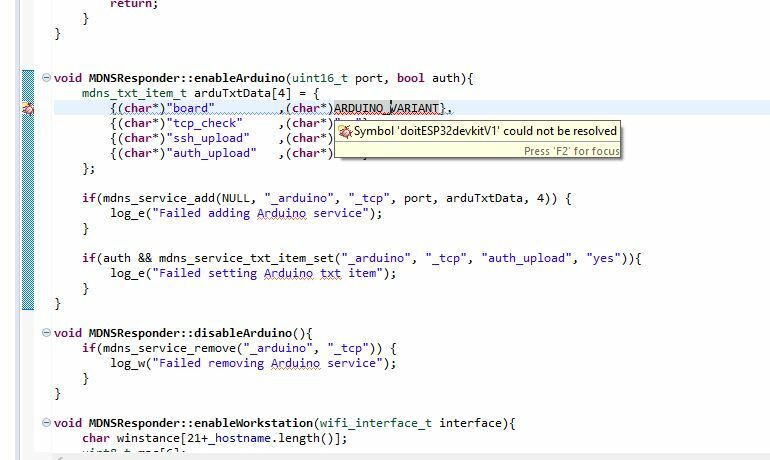 Everything compiles, everything works, but in the code window Serial1 is underlined red and flagged Symbol 'Serial1' could not be resolved. But when I compile I get 0 errors, 0 warnings, and like I said everything works, but the error flag in the code remains. It's not actually causing an issue, but the red marks feel like they are mocking me! That sorted it out. Thanks! I'm trying to compile the basicOTA.ino sample with Sloeber 4.3 for the esp32 but keep getting error's. It's totally not clear to me what's wrong. For the esp8266 it works fine and the other (the one i tried) esp32 samples didn't gave me troubles. I tried a lot of suggestions that where found on Github and google but nothing helped me. This is the list of the known issues. Thanks for the quick reply, the solution from issue 1028 will indeed solve the # include filename error, however the other error is still there. "C:\sloeber\/arduino-esp32/tools/xtensa-esp32-elf/bin/xtensa-esp32-elf-g++" -DESP_PLATFORM -DMBEDTLS_CONFIG_FILE="mbedtls/esp_config.h" -DHAVE_CONFIG_H "-IC:\sloeber\/arduino-esp32/tools/sdk/include/config" "-IC:\sloeber\/arduino-esp32/tools/sdk/include/bluedroid" "-IC:\sloeber\/arduino-esp32/tools/sdk/include/bluedroid/api" "-IC:\sloeber\/arduino-esp32/tools/sdk/include/app_trace" "-IC:\sloeber\/arduino-esp32/tools/sdk/include/app_update" "-IC:\sloeber\/arduino-esp32/tools/sdk/include/bootloader_support" "-IC:\sloeber\/arduino-esp32/tools/sdk/include/bt" "-IC:\sloeber\/arduino-esp32/tools/sdk/include/driver" "-IC:\sloeber\/arduino-esp32/tools/sdk/include/esp32" "-IC:\sloeber\/arduino-esp32/tools/sdk/include/esp_adc_cal" "-IC:\sloeber\/arduino-esp32/tools/sdk/include/esp_http_client" "-IC:\sloeber\/arduino-esp32/tools/sdk/include/esp_https_ota" "-IC:\sloeber\/arduino-esp32/tools/sdk/include/esp-mqtt" "-IC:\sloeber\/arduino-esp32/tools/sdk/include/esp-tls" "-IC:\sloeber\/arduino-esp32/tools/sdk/include/ethernet" "-IC:\sloeber\/arduino-esp32/tools/sdk/include/fatfs" "-IC:\sloeber\/arduino-esp32/tools/sdk/include/freertos" "-IC:\sloeber\/arduino-esp32/tools/sdk/include/heap" "-IC:\sloeber\/arduino-esp32/tools/sdk/include/http_server" "-IC:\sloeber\/arduino-esp32/tools/sdk/include/jsmn" "-IC:\sloeber\/arduino-esp32/tools/sdk/include/log" "-IC:\sloeber\/arduino-esp32/tools/sdk/include/mdns" "-IC:\sloeber\/arduino-esp32/tools/sdk/include/mbedtls" "-IC:\sloeber\/arduino-esp32/tools/sdk/include/mbedtls_port" "-IC:\sloeber\/arduino-esp32/tools/sdk/include/newlib" "-IC:\sloeber\/arduino-esp32/tools/sdk/include/nvs_flash" "-IC:\sloeber\/arduino-esp32/tools/sdk/include/openssl" "-IC:\sloeber\/arduino-esp32/tools/sdk/include/spi_flash" "-IC:\sloeber\/arduino-esp32/tools/sdk/include/sdmmc" "-IC:\sloeber\/arduino-esp32/tools/sdk/include/smartconfig_ack" "-IC:\sloeber\/arduino-esp32/tools/sdk/include/spiffs" "-IC:\sloeber\/arduino-esp32/tools/sdk/include/tcpip_adapter" "-IC:\sloeber\/arduino-esp32/tools/sdk/include/tcp_transport" "-IC:\sloeber\/arduino-esp32/tools/sdk/include/ulp" "-IC:\sloeber\/arduino-esp32/tools/sdk/include/vfs" "-IC:\sloeber\/arduino-esp32/tools/sdk/include/wear_levelling" "-IC:\sloeber\/arduino-esp32/tools/sdk/include/xtensa-debug-module" "-IC:\sloeber\/arduino-esp32/tools/sdk/include/lwip" "-IC:\sloeber\/arduino-esp32/tools/sdk/include/coap" "-IC:\sloeber\/arduino-esp32/tools/sdk/include/console" "-IC:\sloeber\/arduino-esp32/tools/sdk/include/expat" "-IC:\sloeber\/arduino-esp32/tools/sdk/include/json" "-IC:\sloeber\/arduino-esp32/tools/sdk/include/newlib" "-IC:\sloeber\/arduino-esp32/tools/sdk/include/nghttp" "-IC:\sloeber\/arduino-esp32/tools/sdk/include/soc" "-IC:\sloeber\/arduino-esp32/tools/sdk/include/wpa_supplicant" -std=gnu++11 -fno-exceptions -Os -g3 -Wpointer-arith -fexceptions -fstack-protector -ffunction-sections -fdata-sections -fstrict-volatile-bitfields -mlongcalls -nostdlib -Wall -Werror=all -Wextra -Wno-error=unused-function -Wno-error=unused-but-set-variable -Wno-error=unused-variable -Wno-error=deprecated-declarations -Wno-unused-parameter -Wno-sign-compare -fno-rtti -MMD -c -DF_CPU=240000000L -DARDUINO=10802 -DARDUINO_ESP32_DEV -DARDUINO_ARCH_ARDUINO-ESP32 -DARDUINO_BOARD="ESP32_DEV" -DARDUINO_VARIANT="doitESP32devkitV1" -DESP32 -DCORE_DEBUG_LEVEL=0 -I"C:\sloeber\arduino-esp32\cores\esp32" -I"C:\sloeber\arduino-esp32\variants\doitESP32devkitV1" -I"C:\sloeber\arduino-esp32\libraries\ArduinoOTA\src" -I"C:\sloeber\arduino-esp32\libraries\ESPmDNS\src" -I"C:\sloeber\arduino-esp32\libraries\Update\src" -I"C:\sloeber\arduino-esp32\libraries\WiFi\src" -MMD -MP -MF"libraries\ESPmDNS\src\ESPmDNS.cpp.d" -MT"libraries\ESPmDNS\src\ESPmDNS.cpp.o" -D__IN_ECLIPSE__=1 -x c++ "C:\sloeber\arduino-esp32\libraries\ESPmDNS\src\ESPmDNS.cpp" -o "libraries\ESPmDNS\src\ESPmDNS.cpp.o"
This brings me to ESPmDNS.cpp where a symbol cold not be resolved. I Tried the suggestion's that has been done for a esp8266 in issue #960, but could not find the file mentioned by you. When commenting out this line in ESPmDNS it will compiles fine. However this is not "the" solution. Any tips where to look at what the problem is with the symbol? It works, thanks again for your help and Sloeber. I'm trying to find out since hours the differences between Sloeber V4 and Eclipse C++ IDE for Arduino 3.0. Which one is the recommended tool? I tend to use Sloeber since the IDE 3.0 has an annoying bug with include resolving. But I'm still interested about your thoughts on why using Sloeber.